The wild fermentation is finished off with cultured brettanomyces, which lend a noticeable sour note. This culinary delight is a rich farmhouse-style saison brewed with a generous helping of aromatic Turkish bay leaves and a dose of coarsely ground Tellicherry black peppercorns. 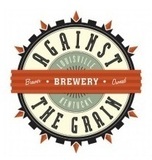 As a collaboration between celebrated Louisville chef, Josh Lehman, and the brewers at Against the Grain, this beer highlights the interplay of cooking and brewing in a single glass. Complex, yet refreshing, this beer has a wild, perfumely aroma that prepares the palate for the tangy, yeasty flavor that mingles with spiciness from the spices as well as the phenols produced in fermentation.